1 LOCAL OFFER As part of the Children and Families Bill (2014), schools are required to publish and keep under review, information about services they expect to be available in their setting for children who have special educational needs and/or disabilities (SEND). This is known as the LOCAL OFFER. 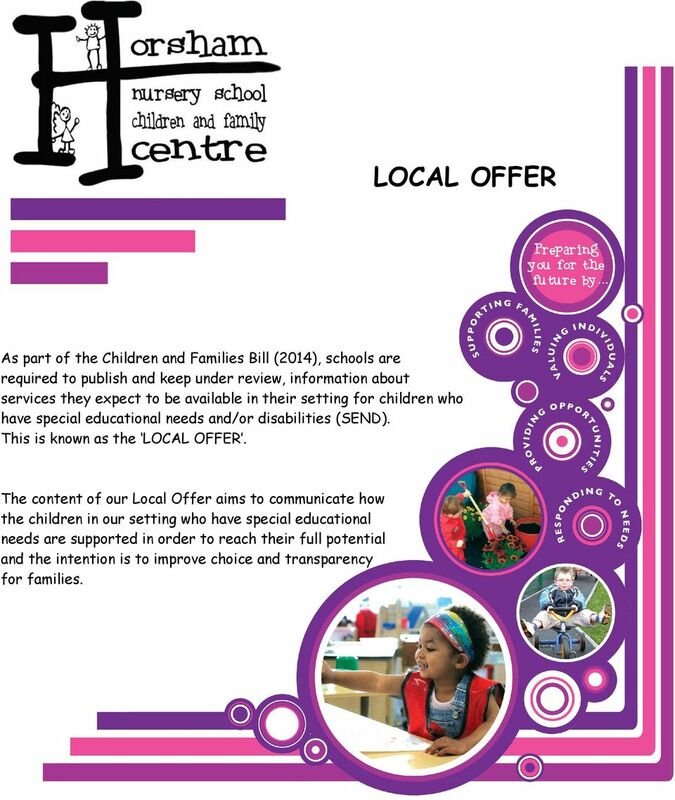 The content of our Local Offer aims to communicate how the children in our setting who have special educational needs are supported in order to reach their full potential and the intention is to improve choice and transparency for families. 2 1. How does the setting know if children need extra help and what should I do if I think my child may have special educational needs or disabilities? Close communication between the nurseries/centre/parents/carers and outside agencies is key to our philosophy when working with children and families. We are flexible in our approach, valuing and welcoming other s opinions and concerns and tailoring what we do to suit the individual needs of the child. If you know your child has Special Educational Needs or Disabilities (SEND) we would encourage you to visit the nursery/centre to ensure that you feel it meets the needs of your child. All children receive a home visit before they start nursery. Information provided by parents/carers at these visits is used to inform and determine specific needs that individual children may have. The Early Years Planning and Review Meeting (EYPARM) members regularly discuss known children with additional needs and with parental permission this information is shared with the nursery. The nurseries have a rigorous system of observations, assessments and on-going monitoring that tracks progress and identifies next steps for the children. If your child is not making the expected progress, their keycarer will share this with you and together, we will decide what additional or different experiences are necessary. If you have concerns about your child or think they may have special educational needs, arrange to talk to their keycarer. This may be done at the initial home visit or once they have started nursery. You may also choose to share your concerns when you are initially shown around the nursery by the Headteacher or Under 3 s Manager. 2. How will the setting staff support my child? Horsham Nursery School Children and Family Centre is an inclusive environment, providing a range of sessions and support that are accessible. The centre has been awarded a PAT Mark which recognises the inclusive delivery and environment. As staff we welcome all children into the setting and work together as a team to support all individuals during the session. Each child is allocated a keycarer, who is the main point of contact for you and your family. This member of staff has overall responsibility for overseeing your child s progress and planning for their learning. This is further supported by another keycarer and teaching assistant as a team of three, who ensure that any planned individual programmes and support are carried out. In some cases, a member of staff is appointed to support a child on a one-to-one basis. Key carers, the Special Educational Needs Coordinator (SENCO), outside agencies and parents work closely together to develop Individual Plans for children which are reviewed regularly. These plans include specific targets, suggested experiences and indicate who carries out the plan and how often. 3 The Governing Body has a Special Educational Needs and Disability (SEND) Governor who is involved in SEND issues and developments within the setting. Progress of children with additional needs is monitored termly by way of Individual Plan Reviews and Curriculum Coordinators review assessment data, paying particular attention to the Special Educational Needs and Disabilities (SEND) category of children. In addition, the progress of children with an Education, Health and Care Plan (EHCP) is reviewed every 6 months. If families are working with the Family Outreach Worker, following discussions and with your permission, they may share information with and seek advice from the Early Support Coordinator and/or Portage to establish ways forward for your child. 3. How will the curriculum be matched to my child s needs? Regular observations, monitoring and assessments of the children give staff the information they need to establish where the children are and where they need to go next and this is logged regularly in the children s Assessment Booklets. 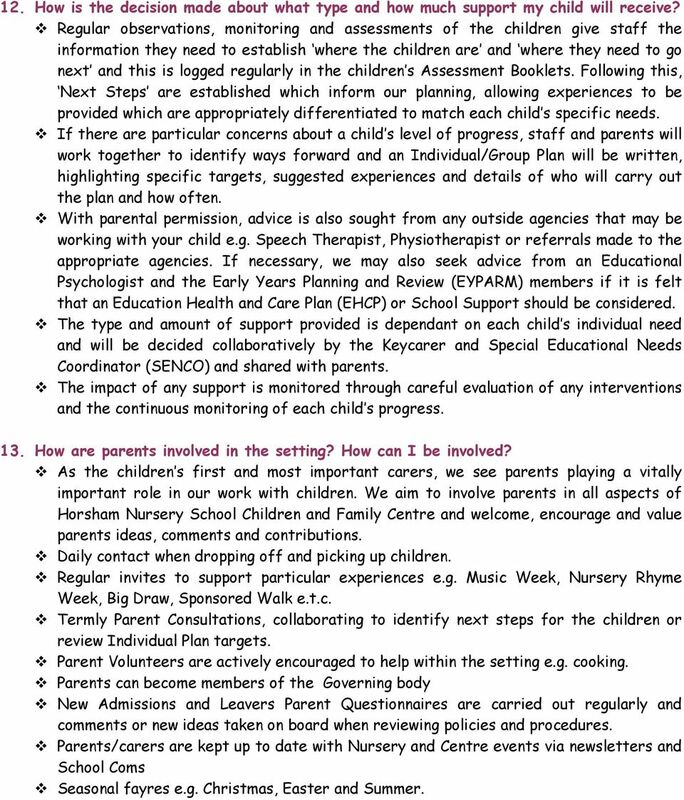 Following this, Next Steps are established which inform our planning, allowing experiences to be provided which are appropriately differentiated to match each child s specific needs. Experiences are adapted to allow for all children to access them in the way that suits them best. Regular meetings between key carers and parents to review children s progress ensure that the individual needs of all the children are met. Individual Plans/Early Support Plans are used to support children with specific needs in the nurseries and the Special Needs and Parents (SNAP) group, e.g. speech and language, physiotherapy e.t.c. 4. How will both you and I know how my child is doing and how will you help me to support my child s learning? We have an Open Door policy where parents/carers are able to discuss concerns, issues and progress with the keycarer and other staff whenever is necessary. Termly Parents meetings are arranged to share the progress that the children are making. Tracking sheets which demonstrate the children s levels of development provide information about where they are and where they should be. Next steps and ways to further support the learning at home are also discussed. Termly reviews between parents and key carers of Individual Plans. 6 Monthly and Annual Reviews are held for children who have an Education Health and Care Plan (EHCP) involving all professionals who support the child in whatever capacity. Home/School Communication Books are sometimes used to ensure daily information is shared. A range of information sessions and courses are provided to enable parents/carers to support their child s learning e.g. Family Numeracy, Solihull Training, Toilet Training, Learning with your toddler, Why do they do that? Behaviour Training etc. 5 All majority of staff in the Under 3 s nursery hold a Level 3 qualification, with some qualified to degree level which include a qualified teacher and an Early Years Professional. All staff working directly with children in the Children s centre hold a minimum Level 3 Child Care qualification. The Children s Centre staff have attended specialist SEND training (Special Educational Needs and Disabilities) in our role as Early Years Hub. 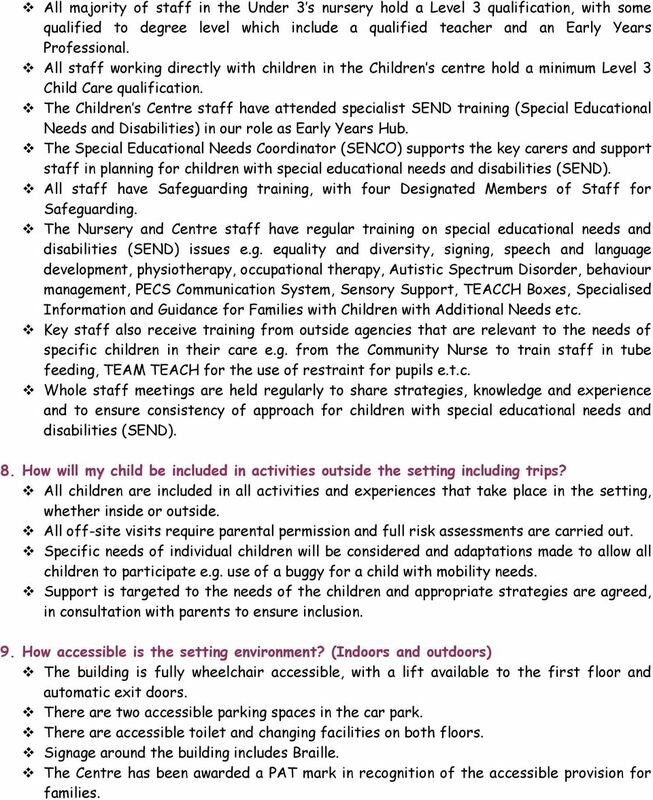 The Special Educational Needs Coordinator (SENCO) supports the key carers and support staff in planning for children with special educational needs and disabilities (SEND). All staff have Safeguarding training, with four Designated Members of Staff for Safeguarding. The Nursery and Centre staff have regular training on special educational needs and disabilities (SEND) issues e.g. equality and diversity, signing, speech and language development, physiotherapy, occupational therapy, Autistic Spectrum Disorder, behaviour management, PECS Communication System, Sensory Support, TEACCH Boxes, Specialised Information and Guidance for Families with Children with Additional Needs etc. Key staff also receive training from outside agencies that are relevant to the needs of specific children in their care e.g. from the Community Nurse to train staff in tube feeding, TEAM TEACH for the use of restraint for pupils e.t.c. Whole staff meetings are held regularly to share strategies, knowledge and experience and to ensure consistency of approach for children with special educational needs and disabilities (SEND). 8. How will my child be included in activities outside the setting including trips? All children are included in all activities and experiences that take place in the setting, whether inside or outside. All off-site visits require parental permission and full risk assessments are carried out. Specific needs of individual children will be considered and adaptations made to allow all children to participate e.g. use of a buggy for a child with mobility needs. Support is targeted to the needs of the children and appropriate strategies are agreed, in consultation with parents to ensure inclusion. 9. How accessible is the setting environment? (Indoors and outdoors) The building is fully wheelchair accessible, with a lift available to the first floor and automatic exit doors. There are two accessible parking spaces in the car park. There are accessible toilet and changing facilities on both floors. Signage around the building includes Braille. The Centre has been awarded a PAT mark in recognition of the accessible provision for families. 6 We provide a very visual environment with information accessible via signs, posters, pictures, photographs and plasma screen slide shows. Signing and visual prompt cards are regularly used to support children with speech and language delay and those whose first language is not English. Organise the availability of specialist equipment e.g. walkers, supportive seating, radio aid e.t.c. through liaison with outside agencies. 10. How will the setting prepare and support my child to join the setting and transfer to a new setting? Families are encouraged to visit the setting to ensure that they feel it meets the needs of their child. 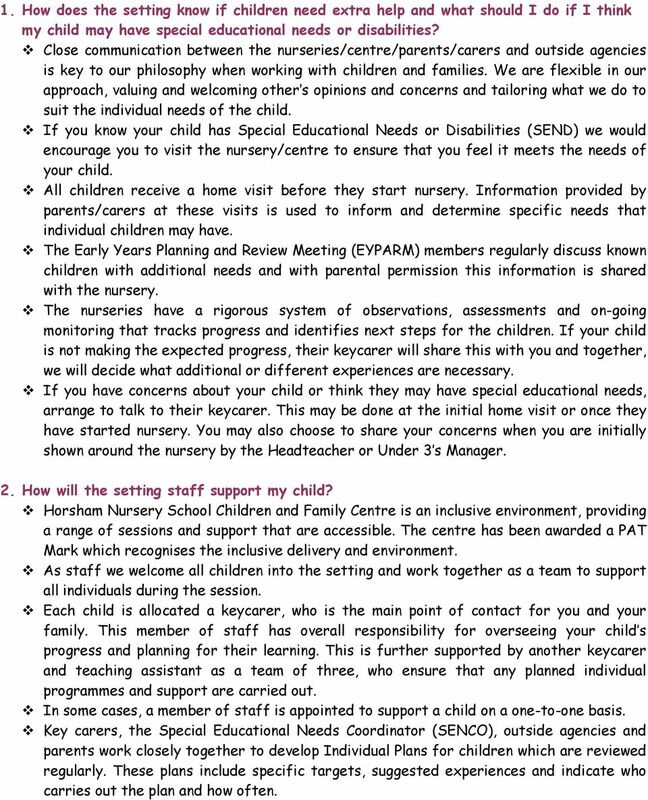 We receive information from the termly Early Years Planning and Review Meeting (EYPARM) about children who will be joining us, indicating the levels of need and support required, allowing us to begin to plan appropriate support e.g. staff, resources The majority of children receive a home visit before they start nursery. Information provided by parents/carers at these visits is used to inform and determine specific needs that individual children may have. Once your Home visit has taken place, you are invited to visit with your child as many times as you like, helping to familiarise yourselves with the new environment and the key staff who will be working with your child. We believe in a flexible approach to transition and induction for your child and will regularly review the process with you to ensure that it continues to meet their needs. Communication between home and nursery school is vital and we ensure there is an ongoing dialogue. Transition to Primary school is carefully planned with Transition Meetings held between parents, nursery staff and the receiving school to pass on information and agree an appropriate Transition Plan e.g. staff visits, school visits etc. Preparing the children for transition plays an important part in our planning and we make regular use of role play, stories and photograph books to support the children through this process. A Starting School Information Session is held for parents/carers to provide helpful tips and ideas about how to support your child through the process of transition to school. Members of staff are also available to assist parents with the school application process if required. 11. How are the settings resources allocated and matched to children s special educational needs? The nursery has an excellent provision of resources which is regularly reviewed, updated and improved. Any additional resources required, including additional staff, are allocated in accordance with the specific needs of the children in the setting. 7 12. How is the decision made about what type and how much support my child will receive? Regular observations, monitoring and assessments of the children give staff the information they need to establish where the children are and where they need to go next and this is logged regularly in the children s Assessment Booklets. Following this, Next Steps are established which inform our planning, allowing experiences to be provided which are appropriately differentiated to match each child s specific needs. If there are particular concerns about a child s level of progress, staff and parents will work together to identify ways forward and an Individual/Group Plan will be written, highlighting specific targets, suggested experiences and details of who will carry out the plan and how often. With parental permission, advice is also sought from any outside agencies that may be working with your child e.g. Speech Therapist, Physiotherapist or referrals made to the appropriate agencies. If necessary, we may also seek advice from an Educational Psychologist and the Early Years Planning and Review (EYPARM) members if it is felt that an Education Health and Care Plan (EHCP) or School Support should be considered. The type and amount of support provided is dependant on each child s individual need and will be decided collaboratively by the Keycarer and Special Educational Needs Coordinator (SENCO) and shared with parents. The impact of any support is monitored through careful evaluation of any interventions and the continuous monitoring of each child s progress. 13. How are parents involved in the setting? How can I be involved? As the children s first and most important carers, we see parents playing a vitally important role in our work with children. We aim to involve parents in all aspects of Horsham Nursery School Children and Family Centre and welcome, encourage and value parents ideas, comments and contributions. Daily contact when dropping off and picking up children. Regular invites to support particular experiences e.g. Music Week, Nursery Rhyme Week, Big Draw, Sponsored Walk e.t.c. Termly Parent Consultations, collaborating to identify next steps for the children or review Individual Plan targets. Parent Volunteers are actively encouraged to help within the setting e.g. cooking. Parents can become members of the Governing body New Admissions and Leavers Parent Questionnaires are carried out regularly and comments or new ideas taken on board when reviewing policies and procedures. Parents/carers are kept up to date with Nursery and Centre events via newsletters and School Coms Seasonal fayres e.g. Christmas, Easter and Summer. Our Local Offer for Special Educational Needs and Disability (SEND) Rosewood Free School is a maintained special school in Southampton for children with PMLD complex physical, medical and learning difficulties. Teaching Assistants will be allocated to support classes where appropriate. Appropriate and effective teaching and learning A Partnership approach Open and honest communication Hello and welcome to St Matthew s Special Educational Needs zone. My name is Ms Devi and I am the SENCo. 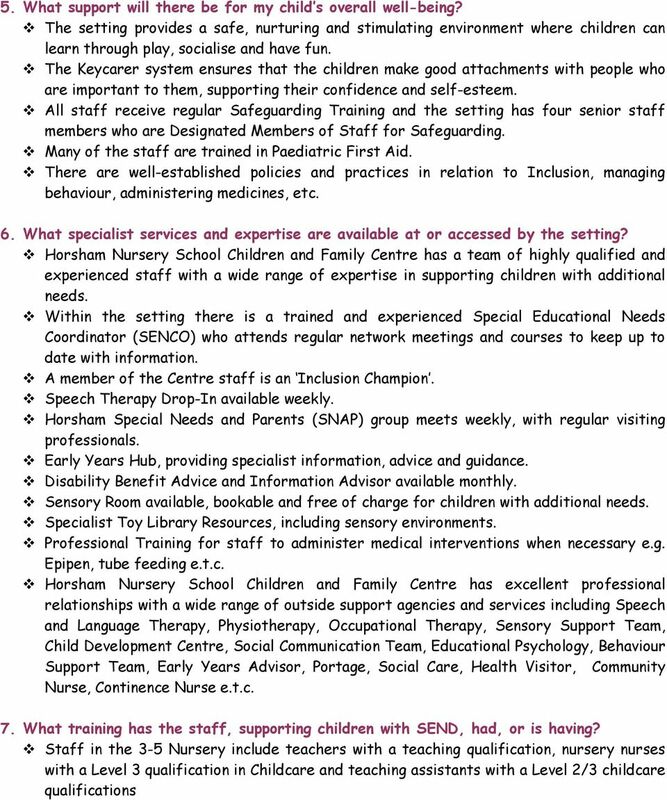 The Role of the Special Educational Needs Coordinator (SENCo) in mainstream schools. URMSTON INFANT SCHOOL Managing Medical Needs Policy Urmston Infant School MANAGING MEDICAL NEEDS POLICY This policy is supplemental to Infant School's 'Health and Safety Policy' and 'First Aid Policy'.